Used Royal Enfields doubling in value? Used Royal Enfield motorcycles have nearly doubled in value since Royal Enfield introduced its new models. "It’s not only wine. Even iron becomes valuable over time, especially if it rolls on two wheels and has ‘Royal Enfield’ stamped on the fuel tank. Thousands of biking aficionados across the country are discovering to their dismay that the world’s oldest motorcycle in production has become more expensive, not only in showrooms but also in the large unorganised pre-owned domestic two-wheeler market." How can this be? Sarkar's article attributes it in part to the fact that the new Royal Enfields, with their advanced features and improved reliability, are more expensive than the models they replaced. Naturally, this lifts the value of the used motorcycles they compete against, to some degree. But he also cites the preference among some Indians for the classic, iron barreled Royal Enfield, with its "classic Royal Enfield charm," including its "niggling mechanical faults." Most of all, some Indians apparently feel the new models, with their all-aluminum motors, lack the characteristic sound of a Royal Enfield, the treasured "thump" akin to the famed potato-potato sound of a Harley-Davidson. Will we notice this same increase in the price of used Royal Enfields in the United States? For one thing, Sarkar doesn't mention that the new Royal Enfields are in such demand in India that there are waiting lists for delivery. The company is working to increase production to meet demand. Meanwhile, some customers will naturally give up and fall back on the used motorcycle market, driving up prices. 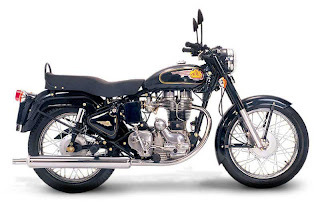 New Royal Enfields are not yet in critically short supply in the U.S.
"Twenty-three-year-old media executive Abhimanyu Chakravorty wanted to buy his first Royal Enfield bike. After scouting for a few bikes in Karol Bagh, the capital’s dingy pre-owned automobile hub, he had to shell out Rs 40,000 ($856) for a 2001 Standard model. "'A few months ago, 10-year-old Royal Enfield bikes were selling for around Rs 15,000 ($321) to Rs 20,000 ($428), depending on the condition of the machine,' he says."